Nintendo has announced that two of its best-selling Switch titles, Zelda: Breath of the Wild and Super Mario Odyssey, will be getting VR support through Nintendo’s Labo VR Kit. 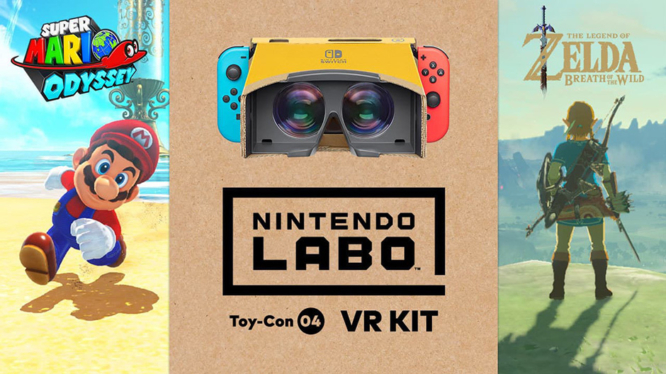 Starting April 25th 2019, players will be able to experience both award-winning titles in a brand new way with Nintendo’s Toy-Con VR Goggles. VR support for Super Mario Odyssey and Breath of the Wild is certainly an unexpected, but very welcome, surprise for the Nintendo Switch. 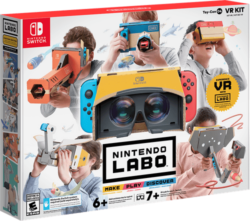 Having already announced the Labo VR Kit last month, then later revealing it would include over 70 games and activities, Nintendo definitely seems keen on supporting their latest cardboard creation. Labo VR compatibility for the critically-acclaimed Switch titles will be available through a free software update on April 25th 2019. However, players will need to own one of Nintendo’s Labo VR Kits (launching April 12th) to make use of the brand new features. The full VR Kit is currently available to pre-order on Amazon for around $79.99 / £69.99, with the Blaster Starter Kit retailing for the slightly lower price of $39.99 / £49.99. Players on a budget will be pleased to hear that only the VR Goggles will be needed for both titles, so should be able to opt for the cheaper kit to experience these additional VR features. Once updated, a new menu item will appear in The Legend of Zelda: Breath of the Wild’s game options that allows players to enable and disable VR support. Boasting full VR compatibility throughout every playable section of the game, Breath of the Wild’s VR mode can be freely toggled on and off at any point during the play-through. Nintendo has also stated that players will be able to use existing save files to carry on their adventure in VR, but in-game cut-scenes will still be rendered in a standard format. Super Mario Odyssey’s VR mode is slightly different to that provided by Breath of the Wild, offering a “bonus experience in simple, shareable VR”. Once paired with the Toy-Con VR Goggles, players will be able to take on new VR challenges in the Seaside, Luncheon and Cap Kingdoms. The challenges, which range from collecting coins to finding musical instruments, are described as “family-friendly” “bite-sized” bonus experiences. Suggesting that Odyssey is more of an additional VR experience when compared to the support offered in Breath of the Wild. The Legend of Zelda: Breath of the Wild and Super Mario Odyssey’s free VR compatibility updated is slated to release on April 25th, roughly two weeks after the Labo VR Kit’s launch on April 12th 2019. Players will need to own both the original game software and the Toy-Con VR Goggles to play the new modes. Monolith Soft could be designing the next Zelda protagonist. Get ready to fight Bokoblins to the beat of the Overworld Theme!